It opens with an unrelenting storm, lightning cracks across the sky, and a torn red cloth thrashes helplessly in the wind. Having fallen into the sea and washed ashore on a mysterious island, a young boy, Enu, wakes near long-forgotten ruins – soon letting his curiosity get the better of him as he sets out on a remarkable journey. RiME is a beautiful game that can readily enchant like no other, the player losing themselves to unending wanderlust as they search out and decipher the secrets that surround the crumbling remnants of what you soon discover to be an ancient civilisation. While early chapters look to impress the player in letting them become lost wandering around the island’s grandiose scale, it is when this puzzle adventure descends into the ruin’s abandoned halls and darkened caverns that it can repeatedly astound in its breathtaking artistry. It is a rewarding sense of discovery that invisibly leads you by the hand in RiME, something that catches your eye soon resulting in a meandering trek to see if it was anything worthwhile. With a courageous fox as a friendly companion and guide on your adventure, the player, more often than not, will look for her bold orange fur as a stark contrast against the ruin’s white brickwork to point them in the right direction. Beyond that, it’s left to you to work out how to overcome the puzzles and obstacles that hinder your progress, or you can simply choose to ignore them and explore your surroundings. However, there is no shortage as to what developer Tequila Works has turned to in order to create such conundrums, whether that be sound, light and shadow projection, perspective-orientated puzzles, weighted switches, or water to unleash. While they are often clever in execution, most players won’t have much trouble in working out their solutions and I only had to resort to Google for pointers on two separate occasions. It’s fair to see that RiME would rather have you journey onward, than have you wracking your brain in one location for hours on end. Between puzzles, players will be climbing, leaping, pulling boxes, and swimming ever deeper underwater to discover new places on the island as they journey to reach what awaits them at the top of the central tower – playful exploration that has seen the developer mischievously hide collectables as a reward for your curiosity. Outfits, toys, emblems, and keyholes that reveal more about Enu’s past, these are a welcome distraction for those that want to spend as much time in RiME‘s sun-drenched world as they can. It is the final chapter, some six or so hours in, that startles with an unanticipated change to your perspective on your entire journey in leading to an emotional choke point that reveals that not all is as it seems. It’s a poignant moment that most will, understandably, not want to be ruined, but know that it will profoundly recolour your whole experience and elevates the game to a whole new level. 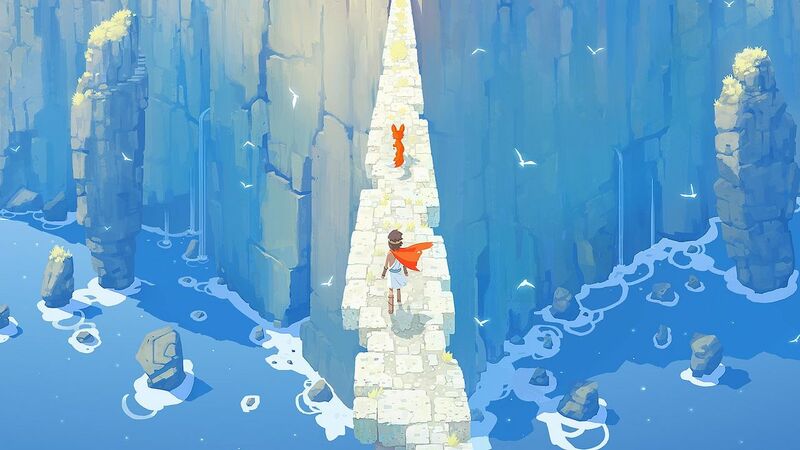 But, the kicker is that the Nintendo Switch is not the best place to experience the memorable tale that RiME expressively portrays. The game, which had its Mediterranean-inspired island meticulously built with Unreal Engine 4, receives a port that is lamentably riddled with compromises. Whether at home in TV mode or on the go in Handheld mode, the cel-shaded sheen retains little of the magic seen on other platforms with reduced graphical fidelity resulting in washed out visuals and an inconsistent framerate plaguing your journey from the start right through to, and laughably including, the credits sequence. Tequila Works has, today, stepped in to explain that these are loading hitches, that come in response to a technique that they use called streaming – where parts of the level load and unload to save on memory utilisation. To address it, that saw the team ponder adding intermittent loading screens in each stage or rebuilding the game entirely, but they ultimately chose to live with the problem “to preserve what the game was intended to be.” I can wholly respect their decision, but the result for you, as the consumer that is expected to fork out for the game, is the bumpiest journey that I have had to endure in some time. It’s a tremendous shame, seeing as this otherwise outstanding and intimate adventure rightly feels at home on the plucky portable home console. I know that it doesn’t have as much muscle as PlayStation 4 and Xbox One, but it is troubling to see what heavy-handed sacrifices Tequila Works and Tantalus Media have had to make to port RiME to Nintendo Switch. In its current state, it becomes hard to recommend – even with the added promise of being able to enjoy playing it wherever you like. If there’s one thing that remains undamaged in the porting process, it is the music penned by composer David García Díaz. His emotive score is a powerful accompaniment to the game, and, more importantly, your journey, with melancholic, contemplative, and rapturous melodies perfectly expressing every moment. RiME still amounts to a meaningful experience, and, despite being stacked against some tough competition, stands proudly as one of the more memorable journeys that you will set out on this year. It is certainly an adventure that you shouldn’t miss, but a poor technical performance on Nintendo Switch may see you washing ashore on other platforms rather than choosing to persevere.